A couple of weeks ago I decided to take time off from this blog. I was spending too much time writing and reading and needed to rebalance. At roughly the same time, a number of philosophical and mathematical questions were swirling around in my brain and instead of touching base with reality, I wandered of into the dark forest of mathematics. At first I knew where I was going, I had a map in my head. I listed a number of ‘problems’ that I could sense the solution for and went about solving them. I started writing a paper on the fundamentals of fractals and made good progress. Although it may be hard to appreciate, there is amazing beauty in mathematics. There are certain equations that show symmetry, balance, depth and colour and when a mathematician looks at these, he or she will just stare in silent reverence. These equations were written by the gods of mathematics. One such equation is by Leonhard Euler, a 18th century Swiss mathematician. He wrote what has become known as Euler’s Identity. Richard Feynman called this “the most remarkable formula in mathematics”. It has all mathematical identities: e, i, pi, 1, 0, + and = in the simplest of formulas. Its implications are so fundamental that there isn’t a mathematician in the world that hasn’t wondered if this little equation is somehow the definition of God. But that is Euler and I was still erring in the forest. I got to this sunny clearing in the trees. There was a bench and a little pond and the birds were still celebrating spring. Sun beams traversed the forest canopy and if ever there was a perfect scene, this was it. In in the middle of the clearing, hovering above the pond, an equation emerged. I was looking at something that embodied the fractal research I have been doing. It pointed at the space between things that we see and know. It pointed at unification of many types of fractals that seem very separate and different. It pointed at unknown dimensions that we know must exist but can’t see as yet. Then a cloud rolled over the mountains and the forest got dark very quickly. Now, a smart person would find his way home and make a cup of tea. The darkness beckoned and I left the relative safety of the clearing and wandered into the trees, not sure if I was on a path. I was exploring. Fractals are everywhere. A tree is a fractal. 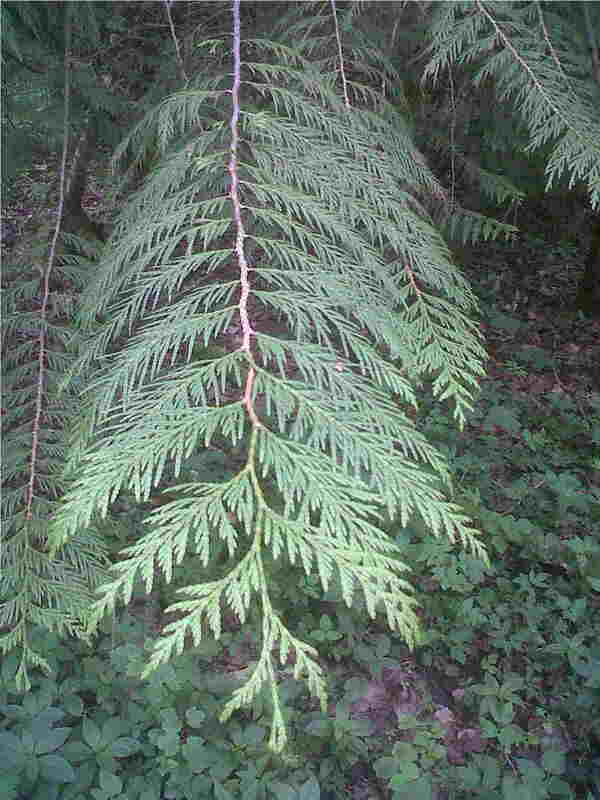 The branch of a branch looks exactly like its parent. The picture below shows such ‘self similarity’ within structure of the pine twigs. Patterns repeat themselves within patterns. Sea shells show fractal patterns, as do mountains, “a bit of mountain looks like the whole mountain”. In mathematics, proof is all. In most other human endeavours it is sufficient to speculate and come up some examples and this can lead to dreadful mistakes and dire misery. But not in mathematics. One reason why it has taken this long for science to understand fractals is not that Euler and his friends couldn’t have done it: they didn’t have the computers you need to do the research. The unmarked path I was on, opened up a little and to my surprise there was a desk with a computer on it. A pretty fast one too! What could I do? I started it up and got up the Ruby development environment. If you are into programming: Ruby is cool. Its history (written by a japanese guy who was fed up with the alternatives), its user community, its documentation it is all refreshing. One of the best language guides I have ever read is by someone called “Why”. His “Why’s poignant guide to Ruby” (here) is weird. It is full of cartoons, dialogue and stories that have nothing to do with Ruby or programming. But they provide just the right distraction and subconscious messages so that you can read the guide leisurely and actually understand it. I had developed a whole suite of software before to draw genetic fractals like the one below. But the software was clumsy and as I had fallen in love with Ruby, I decided to go all the way with her. The night set in and I was still coding behind my forest desk. We spent the night together. There is a special feeling about these all nighters. The rhythm, the exhaustion, the darkness. I often miss that in regular jobs. But in the forest with Ruby; it was great. All this time, my wife was wondering where I was. Worried of course. First the blogging, now this. There was a time when she associated genetic fractals with a lovely idea that amused her husband. Now she frowns and wonders if I will finally go over the edge. But yesterday, I told Ruby to take a break. She looked as sprightly as ever and she’ll be there, the next time I call her. I am still lost in the forest. There are so many more paths I must follow into the darkness of the equation. There are still unresolved problems: sometimes beauty isn’t enough. I go to bed at night and equations and fractals dance before my eyes. They take me into the unconsciousness of dark forests and when I surface in the morning, I see new trails that must be explored. In time I will park all this for the next time when I pass the forest and decide that a little stroll in the land of fractal mathematics can do no harm. 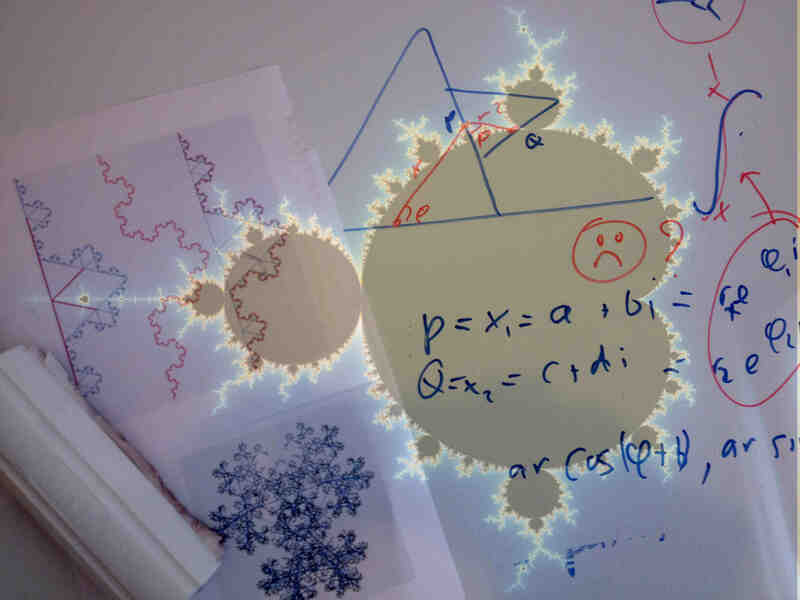 My life has been a fractal mess of travel, writing, mathematics, business, engineering and art. The patterns of one, pop up in the other. I feel at home in this mess and getting lost is big part of finding my way. When I watched “A beautiful mind”, I could understand why the people around John Nash thought that he was mad. By all external measures he was. But I know that the dark forest of mathematics is very real and that not everyone will find the way out or else lead a double life and pretend to be on saner planes when their inner selves are spiralling out of control. So next time you meet a mad mathematician, just wonder where he really is. If I may be bold: I prefer Sylvia Nasar’s “A beautiful mind”; it’s better than the film, but that’s just my personal view. I really like your writing: it’s clear and imaginative and it meanders and leaves much to the imagination. In short: if compliments like these would help to keep you blogging, that would be great. Fortunately, my wife is not married to a genius. I think I’ve said this before – you make numbers fascinating in a way I haven’t often encountered…I love the forest metaphor… The branch fractals plunged me into a deep meditative pond..Thank you! Thanks Lin! When a mathematician looks at the world he or she sees the numbers. It can be both disturbing and amazing. Fortunately meditation allows us to strip it all back to experience. Which, incidentally, is probably my health insurance against madness. Never have I been so fascinated about math…this author brings math alive and takes you on a journey through forests, fractals, philosophy, and a great film …have a look! Thanks for the reblog Bastet. Delighted the math wasn’t a turn-off! Superb! I’m lost for words to describe how brilliant this was. For a physicality you sure make a frightfully good storyteller. First observation: it’d make a wonderful short film. Second observation: i hope you submit this to every and all mathematics/physics journals so it can be published. It’s that good! Thanks John – perhaps I have found my niche! I must say that this (these) blog(s) a great playground for writing and having smart and good people give feedback is priceless. Thanks! I see exactly what you’re coming from. I obsessed over a “fractal integral” (an integral over real-dimensioned sets) for almost two years. I got a definition that worked, but it only gave zero or infinite as a result except for very special cases. I looked at the formula above but I’d like to know what each variable represents! It’s some kind of integro-diferential equation, but I don’t know what the B, f and G stand for (I’m guessing you’re solving for F?). Or maybe I got it completely wrong and it’s just a dynamic-system-like formula where you apply an operator to a point over and over? I’ll send you my paper when I’m done. For now, the BF and BG are binary trees that map the fractal trajectories against reference paths f and g. My premise is that these reference paths are what gives the fractal its properties. Although the reference paths can be discreet, I’m really interested in the analytical continuous functions – for obvious reasons. Tbc! By the way, started reading the Ruby guide. It’s bloody brilliant. It is incredible – it is clearly written by a mad genius. If f and g are discrete, does that not make their presence in differentiated form in your fractal equation above problematic, and a generalised integral over them meaningless ? Some people may believe it but that doesn’t stop it being utter nonsense. You are quite right, my comment to David wasn’t sound/complete. In the form shown, f and g are continuous, as are the specific fractal paths. There is also a summation form to deal with the discrete case. I had no intention to present my work here but used it as a metaphor. I will publish more extensively and hopefully, correctly about this. Regarding market fractals; 90% of life is nonsense and I am fine with that. This post is about the madness we risk to encounter when we stray from the safety of known facts. In this exploration we must cross boundaries that may lead to sense or to nonsense. If at the other side we come out with something worthwhile, that is great. If we don’t, that is just as great, as far as I am concerned. Thanks for the comment and thanks for stopping by.